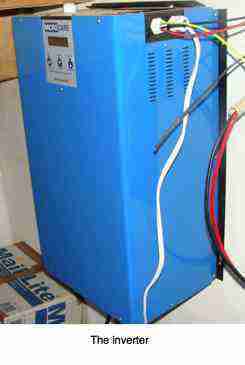 Inverter for home is for generating a high AC voltage from batteries. Inverter for home is useful for generating a high AC voltage from storage batteries that are usually some factor of 12V. It's most often used in the solar power energy environment where sunshine is stored in two or twelve volt DC batteries arranged in series or parallel. New lithium ion batteries are changing the face of storing solar energy; they are cheaper than lead and have much better charge and discharge characteristics. I'm in fact about to make an upgrade after six years of lead cell batteries, and will report shortly. When the source of electricity from the utility is unreliable then an inverter for home is very useful as a backup, whether the batteries are charged from PV panels on the roof, or from a petrol generator, or from the mains utility. They are heavy devices and are usually firmly bolted to the wall or, in the case of our very large 10kW inverter, remain on the floor. Fashionable in some homes and businesses is a small inverter and batteries on a trolley that can be wheeled about to where it's needed when the utility is load shedding, or a tornado has brought down the power lines. Or, as is happening regularly in South Africa, cable thieves have stolen wires for scrap copper. Inverter for home is best turned off at night as it drains your stored energy, says Bernard Preston. Stay on the grid if you possibly can. As with all electrical devices, always purchase a device with a capability that exceeds your needs. It makes no sense to purchase a 1kW inverter for your home if you are regularly going to be drawing 950W. It simply like the proverbial candle won't last the night. As a rule of thumb I try never to exceed 80% of its declared capability. Purchase only a renowned make. Choosing the cheapest inverter for your home is a recipe for disaster. This is certainly true if you are regularly stressing the device near its maximum. We are fortunate in South Africa having a local company that makes extremely good business and home inverters, and MPPTs for the solar industry. Our inverter will energise the electric oven, the bread machine, the coffee maker and all my carpentry tools including the thicknesser. I don't use the welder though, but I suspect it wouldn't be a problem. Every home, whether you're a greenie or not, should have an induction stove though; they are gems, and not expensive, and your inverter loves it for cooking; they draw much less current. Switch off your inverter for home every night. Simply keeping the core activated draws current from the batteries, as will the cooling fan which comes on periodically whether you are using power or not. Your batteries are probably the most expensive part of your solar generator; caring for them is an important facet of the maintenance of the system. I try not to drain my batteries ever below 80% which is why after five years they are still perfect. Switching off the inverter for home at night, and drawing a small amount of electricity from the utility for your flood lights prolongs their life. It means turning off the pool pump too when using the oven or dishwasher, and not using any of these devices on a cloudy day, charged by the inverter for your home; rather use mains power during inclement weather. As a rule of thumb, if the PV panels are providing say 2kW at any one moment, try not to exceed that using your home inverter for any length of time. It means either having sophisticated switching gear that will do it automatically, or you have to keep an eye on the sky. A battery can only be drained a fixed number of times; on every occasion you exceed that, you lose a day of its life; a cheapo will only do a few hundred cycles, but top of the range will run into tens of thousands if you look after them. Solar power energy may be free, but the equipment to collect, store and use that electricity is costly. 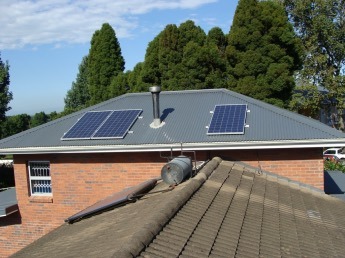 Not exceeding inverter for home's capabilities is an important part of the discipline of being a greenie, or even if you are just doing it to have power when the utility is load shedding. "Many of the first installations of "green energy" alternatives in corporate SA were driven by environmental or social considerations, but uncertainty of supply and rapidly rising tariffs have made off-grid solutions more appealing than ever before." Bronwyn Nortje, BD Live analyst. 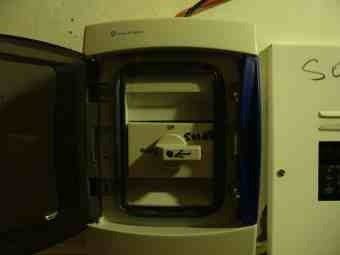 My advice is not to go less than 2kW with your inverter for home, and 3000W of PV panels. The more top notch batteries you purchase, the longer they will last. We have 8 x 200Ah batteries. I'd like to have more, but at around $500 apiece one does think twice before adding extra. I am now considering for the first time, after a mains spike of 420V caused immeasurable damage down our street, going off the grid, with either a lithium ion or Redflow batteries. After the batteries the inverter for home is the next most expensive item; actually on a par with the PV panels on the roof. Make sure you include a knifeblade fuse to protect yourself. I'm currently doing a locum in Holland and it's interesting to note how many homes have added solar arrays since we were last here two years ago. Four kilowatts of panels seems to be the norm, the same as we have. Since penning this page, we have increased our PV panels to 5kW. However, with the tentative decision to go off the grid in the future, we are adding more panels, and a large lithium ion battery to support our aging lead cell batteries. The other moderately expensive item on the agenda, after the inverter for home, is your solar charge controller, or MPPT. It increases the efficiency of PV panels by up to 35%. Once again, I recommend purchasing a larger device than you expect to use, unless you are absolutely certain you are not going to add more panels. For example, if you have decided to add 1kW of west facing solar panels, as I have done, and you're quite sure you won't add more in this orientation, then there's no need for a 60A solar charge controller MPPT. Since PVs don't deliver their maximum potential, a 20 amp solar charge controller MPPT would be quite adequate. I added these west facing PVs to provide extra power in the late afternoon; they are less efficient than those oriented north (in the Southern Hemisphere), and I won't add more. They should incidentally be oriented more steeply than your latitude for the low in the horizon late afternoon sunshine; a mistake I made! When using an inverter for home you cannot simultaneously have another power supply providing electricity; this is where the change over switch comes in. For example, let's say you have a solar generator and are still connected to the grid; should they come on together your inverter for home will be damaged. In between, the solar and grid poles there has to be a neutral supplying neither with energy to the power sockets and lights in your home. I have recently been on a boat; the owner inadvertently started the generator when the inverter was switched on; it was instantly fried. This is an essential device; always use a change over switch. Bernard Preston is a physics major, but he's no electrical engineer; he's a chiropractor at heart; this is hobby. Treat what you read here at inverter for home, if you will, with a pinch of salt. Going green is a huge step and my advice is to talk to as many people as possible. Inverter for home is part of the backyard permaculture philosophy; collecting and storing water and electricity for use in your home and garden. Working with the environment instead of destroying it is our motto. Right now South Africa is suffering from the worst drought some say in a hundred years; certainly forty. That's what global warming does. Floods in India and severely low rainfall in our part of the world. Recent unexpected rains have filled our underground reservoir, but done nothing for the dams that supply the utilities. We have plenty of electricity and water but our neighbours are in dire straights; that's the beauty of permaculture. What I can assure you is that over 40 months we have used on average 63kwh per month, diminishing steadily as I have added more panels. I've just added another 915W of west facing solar panels and am looking to getting our utility consumption down to 30-40kwh per month. Check you own bill to see how much you could save, notwithstanding creating a better world for your children's children. An inverter for home is now absolutely fundamental in Bernard Preston's establishment; we wouldn't be without it. It means free electricity all day, directly from the sun to bake the bread, run the washing machine, roast the chicken and of course provide a steady clean source of electricity for electronica. Here are the three extra west facing panels for collecting the late summer sun. Attention needs to be paid to their placement near chimneys but my experience is that shadows on PV panels have less of a deleterious effect than expected. Notice of course the evacuated tubes and geyser in the foreground; that's where I'd start before thinking of an inverter for home. Most of every home's electricity use is in heating water. In South Africa give consideration to Microcare pure sine wave bi directional inverters. I'm very satisfied.